In my work (day job) I see women from all different cultures around the globe on a daily basis, and I take note of how they present themselves to the world. People’s faces are the first thing you look at when you see someone because it is a natural human instinct to seek out the face. There is a very obvious trend that strikes me whenever I am face to face with French women : the natural freshness of their faces. I see few French women with heavy makeup, but they all seem to have enhanced beauty traits. The secret is moderation. 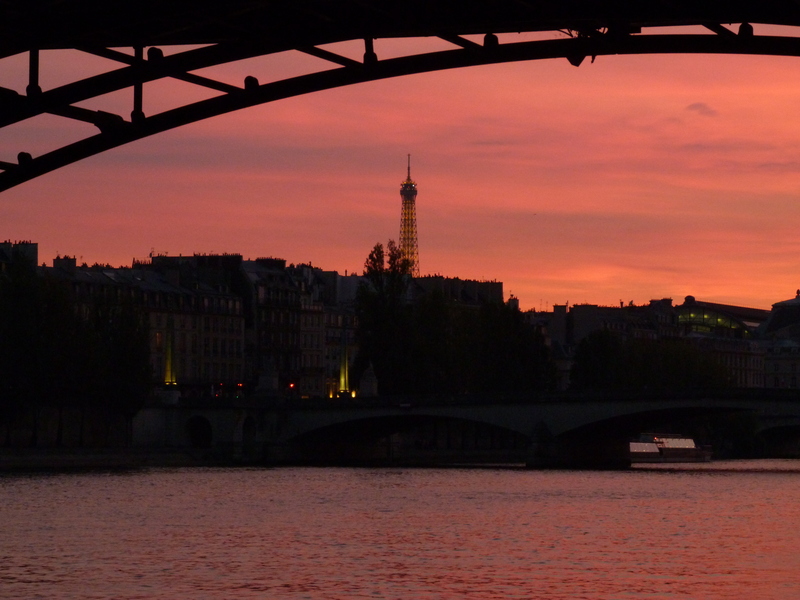 It is the French secret to everything (except political protests of course). Many people have written articles and books on this subject, and I believe that is proof that the world is fascinated by their ability to find a balance between natural beauty and enhanced elegance in order to present their « best » self to the world when out in public. When I tested two Karin Herzog makeup products I found the perfect balance between a heightened sense of beauty and a feeling of lightness as if I was almost wearing no makeup at all. It may be Swiss made, but it’s got French beauty written all over it. (Is anyone counting how many times I write beauty in this article?). 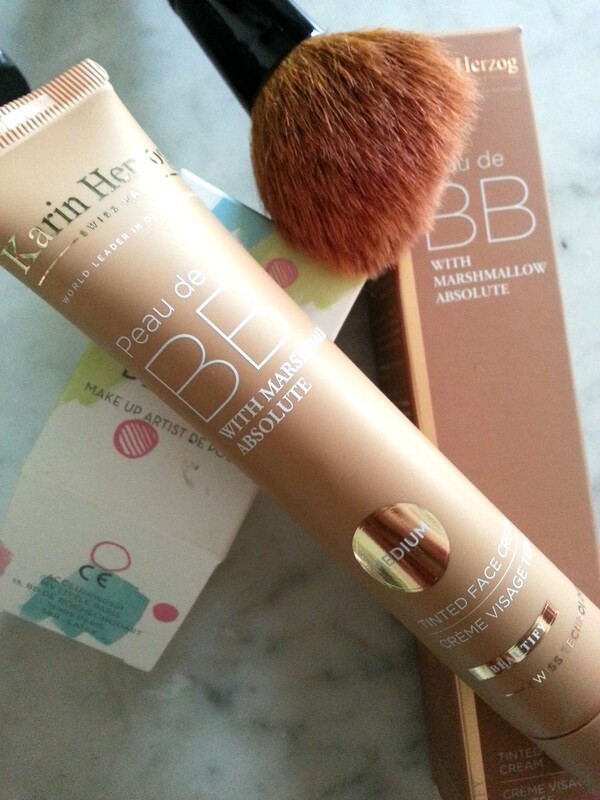 I use the Karin Herzog Peau de BB cream that smooths and evens the skin tone without giving the heavy texture of foundation. Super lightweight and delicately smelling of fluffy marshmallows this cream has a mousse texture when squeezed onto the hand or makeup sponge, and blends into the skin very easily. Once applied, my skin looks more unified (I have slightly blotchy skin) yet does not look like I have makeup on. It’s divine. Really. And the smell of the cream is perfect. I don’t like when makeup smells like makeup, it reminds me of the compact makeup they caked on us when I was a kid performing in the Nutcracker with my ballet studio, and the ladies applying it would call it « pancake makeup! » Yuck! It was horribly thick. Peau de BB is delicate and great for my sensitive skin too. 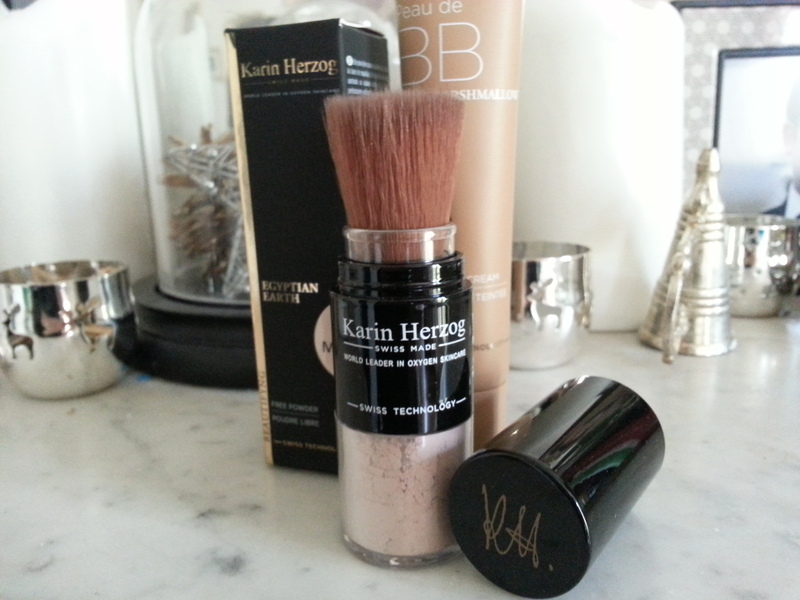 I was also offered the Karin Herzog loose powder brush in Egyptian Earth Magic Moonlight. This is a genius beauty product, because the soft and silky brush that is attached to the powder container, offers the perfect dosage of powder on your face as you gently tap your face with it. It is immediately blended in with gentle and circular brush strokes . I use the powder on the T-zone over the Peau de BB cream, and I get a flawless yet natural look that is matified yet slightly glowing from the Magic Moonlight powder. I am absolutely in love with these two products and they offer me a simple makeup solution that I can apply quickly in minutes. I add a little bit of blush to enhance my cheekbones, some mascara, and a hint of brow pencil, and voilà! I don’t even touch my eyelids with shadow or liner (only for occasions where I really want a dramatic look), because I just want to accentuate my own traits and my personal beauty. Makeup is fun to play with, and I like the idea of having a « fresh canvas » every day to work with, but ever since I became a mom, I don’t have the time to be creative with makeup, and working all day makes me want to have a face that feels light and fresh. So this is the perfect beauty solution for me, and I feel like I adapted perfectly with that French habit for moderation (when it comes to makeup of course… I still have a hard time with moderation when it comes to pastries, and French cheese!). But with Karin Herzog beauty products, I feel « pretty and witty and light!! » LOL! For more French (Swiss) beauty products, browse the Karin Herzog collection here, and enjoy my beauties! That lipstick shade s Perfec for you!